I’m now getting some really fine prints, and I can definitely recommend the WMD extruder and mount. The adjustment for extruder height is still not as easy as I’d like, but it no longer requires tearing apart the whole assembly. Now I have to decide if I should upgrade my other machine as well. So now that I have my printers firmly ensconced in the lives of 3rd through 5th graders, I have to make sure the machines are running all the time. Because my 3rd – 5th graders are designing all the time. Last week, both printers were down with major hardware issues. Fortunately, it was spring break and there were fewer designs coming in. I’ve managed to fix both machines now. One needed a new x-axis stepper cable, which turns out to be a pretty common failure in any of the Makerbot Replicator 2 clones (like my Flashforges). Apparently the movement of the stepper puts a lot of strain directly on the cable, so I expect to see more of these failures in the future. The second machine needed two new thermocouplers (I broke one during an extruder upgrade, and the other while diagnosing the first). Both repairs were pretty simple, once I was confident I knew the problem. My savior was other users who posted problems and solutions all over the internets. So thanks, everyone! Also, I upgraded one of my printers. I added the WMD Extruder Mount Assembly. I think this is going to speed up adjustments down the road. 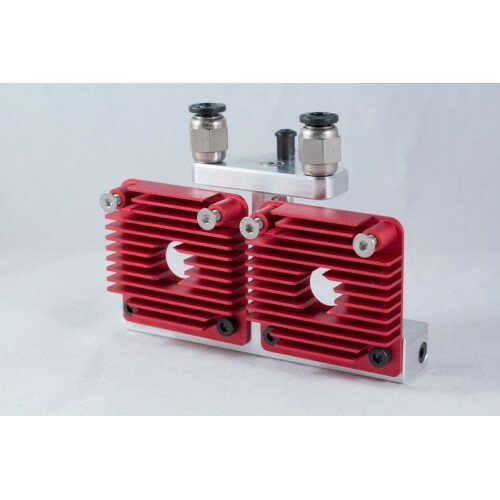 It has a solid metal extruder, fans that connect directly to the heatsink rather than the extruder steppers, and nozzle height adjustment that can be reached without taking the whole thing apart. Nozzle height has been one of my primary headaches so far, so I’m really looking forward to that. Also, it looks a lot cooler than the old system!